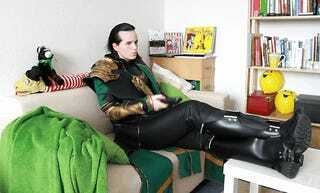 I'm up all night to get Loki! Just finished Thor: The Dark World. Now I am all caught up with the MCU and cannot wait for Captain America: The Winter Soldier, Guardians of the Galaxy and eventually Avengers: Age of Ultron. As someone who has read essentially zero Marvel comics I find myself drawn to these films due to their charm and overall fun attitude. This time around I am glad I will be able to actually see the movies in theaters and be in on the hype when it arrives.